You are here: Home Products and Services miRNA Immunoassays microRNA IN A NEW LIGHT! microRNA IN A NEW LIGHT! MicroRNAs (miRNAs) are new and promising potential biomarkers for diagnosis and prognosis of many diseases, which opens up a new field of goals and challenges for the BioVendor R&D team. Development of miRNA diagnostic assays is just the first step; our mission is to provide validated kits to measure individual miRNAs or diagnostically relevant miRNA “groups” supported with tools for standardized miRNA isolation, sample collection, and pretreatment. MicroRNAs (miRNAs) are involved in virtually all physiologic processes, including differentiation and proliferation, metabolism, hemostasis, apoptosis or inflammation. The biogenesis and function of miRNAs are tightly regulated, and their dysregulation is often associated with pathology of many diseases such as cancer, heart disease or neurological disorders. Recently, the miRNA has been proposed as powerful biomarker for prediction of the diseases, treatment response or prediction of progression. 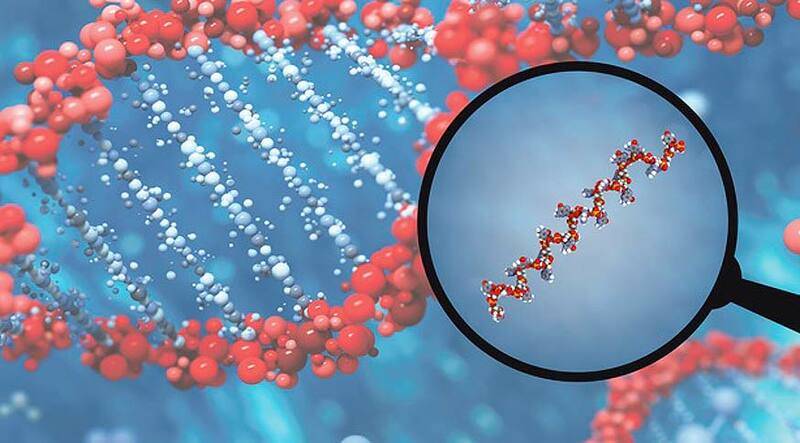 miRNA isolated from a patient sample is hybridized to complementary biotinylated DNA oligonucleotide probe. 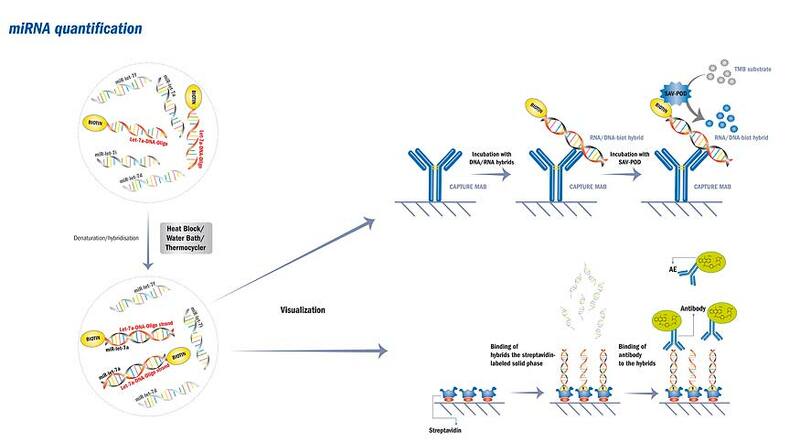 The DNA/RNA hybrids are then processed in the manner of ELISA in a microtiter plate coated with a monoclonal antibody specific to perfectly matched DNA/miRNA hybrids. After washing, the solid phase is incubated with streptavidin-HRP conjugate and the resulting complexes are visualized (after another washing step) by a chromogenic substrate. 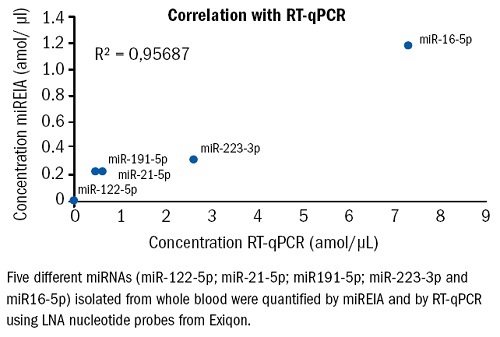 The miREIA exhibits superior analytical specificity, limit of detection as low as 0.1 attomol/μl miRNA, excellent analytical characteristics and strong correlation with the qRT-PCR method (Pearson correlation coefficient >0.9). miREIA can be run on common immunoassay analyzers, is compatible with standard clinical workflow, does not require amplification steps and results are obtained in less than three hours including miRNA profiling. 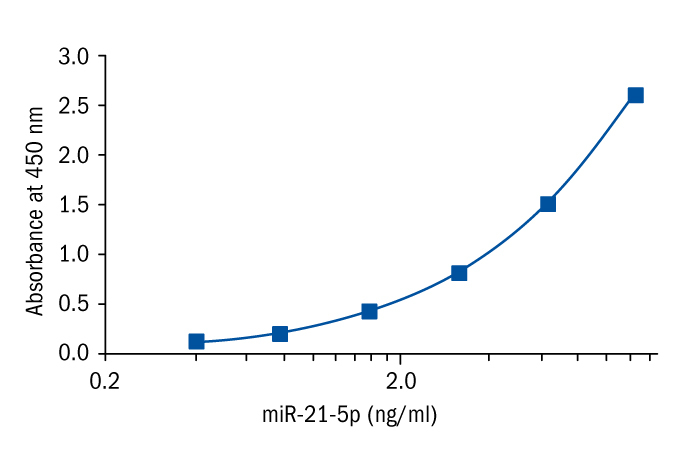 hsa-miR-21-5p is a typical onco-miRNA frequently upregulated in solid tumors, most of the targets are tumor suppressors. Pancreatic, colorectal, gastric, brain, breast, lung, esophageal and hepatocellular cancers were often associated with miR-21-5p. It also plays role in the development of cardiovascular disease, acute myocardial infarction, pulmonary diseases and in regulation of immunological and developmental processes. Besides in tissues, recent evidence indicates the presence of miR-21-5p in various types of extracellular fluid, such as plasma, serum, CSF, saliva, gastric juice, pancreatic juice, sputum, and pancreatic cyst fluid. hsa-miR-93-5p is an onco-miRNA. Up-regulation of miR-93-5p is correlated with worse clinic-pathological features and can serve as an independent marker for poor prognosis in patients with non-small cell lung cancer. NSCLC cell proliferation, migration, and invasion were significantly stimulated by miR-93-5p upregulation and inhibited by miR-93-5p downregulation. miR-93-5p was also up-regulated in non-muscle invasive bladder cancer.Increased expression of circulating miR-93-5p in women with polycystic ovary syndrome may represent a novel non-invasive biomarker for diagnosis. hsa-miR-145-5p might constitute a promising molecular marker for renal cell carcinoma classification and staging. It was described as a prognostic biomarker of overall survival in colon cancer but as a tumor suppressor gene in NSCLC metastasis.Low expression and plasma levels were found in patients with coronary artery disease and acute myocardial infarction. hsa-miR-150-5p is linked with number of cancers. It was up-regulated in plasma of melanoma patients. Findings also demonstrate miR-150-5p as a putative novel biomarker of inflammatory active disease with the potential to be used for early diagnosis of multiple sclerosis. miR-150-5p is downregulated in children with tuberculosis. In aplastic anemia, levels of miR-150-5p were elevated, compared to healthy controls.miR-150-5p is expressed in the lymph nodes, spleen and thymus and it is highly up-regulated during lymphocyte maturation and down-regulated during the activation of mature B and T cells. In vivo studies show that miR-150 is released in the external environment after T cell activation and this may cause an increase of its blood levels during immune system stimulation. hsa-miR-191-5p is dysregulated in many types of cancers (>20) and various other diseases like T2DM, pulmonary hypertension, Crohn’s and Alzheimer’s diseases. miR-191-5p regulates important cellular processes such as cell proliferation, differentiation and apoptosis. miR-191-5p is a promising disease biomarker and therapeutic target. hsa-miR-451a-5p levels are differentially expressed in patients with nonalcoholic fatty liver disease, rheumatoid arthritis, diabetes and several types of cancer including renal cell carcinoma, nonsmall lung cancer, osteosarcoma, esophageal adenocarcinoma and epithelial ovarian cancer. It is overexpressed in endometriotic lesion tissue and is also associated with endometriotic lesion survival.miR-451a-5p is expressed in the circulation, predominantly by erythrocytes, where i tis proposed to play a role in the differentiation and/or maturation of red blood cells. Click to download the poster on microRNA and Cardiovascular Disease. Are you interested in receiving email about the news and events?